The Siddon Print Shop houses several printing presses, print cabinets, and equipment related to the print industry. Visitors can see a Baby Reliance primitive hand press, an 1885 Chandler and Prince letterpress, a Pearl Platin Letterpress circa early 1900’s, a 5 X 8 Kelsey hand operated tabletop letterpress circa 1940’s, and a Challenge Gordon circa 1940-1960 letterpress. Printers’ furniture manufactured by Thompson Cabinet Company of Ludington and an 1870 Roll Top Desk made of cherry wood grace the interior. 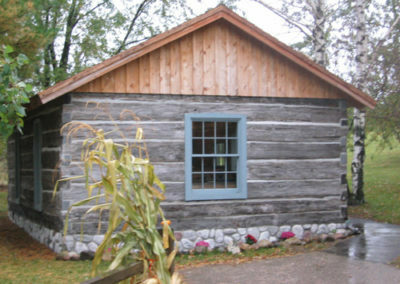 The Siddon Print Shop is the third log building on the grounds and the logs were part of the Siddons Post Office building located on Townline Road in northern Mason County. Built in 1862 by William Freeman on a parcel of land acquired from Charles Mears, the Siddons Post Office was established on February 20, 1882, and served 48 farmers. 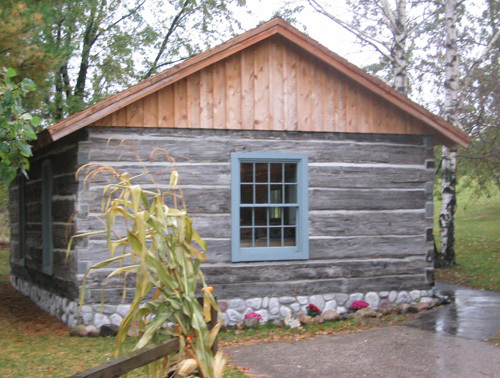 The Siddons Post Office building was donated to Historic White Pine Village by the family of Robert Thompsen, providing the logs for the Siddon Print Shop.